Refer to instructions for levels of use and limitations. Maximum addition level is 10% of binder weight for iron oxide pigments, 2% of binder weight for carbon black. There are no addition level limitations on color paks made in a Custom 45 or Thinfill 55 base. 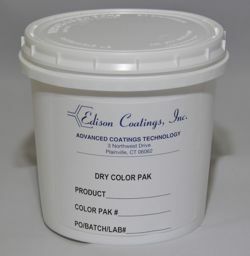 Dry Color Paks, produced either as pure pigments or in the same binder/base as the product to be tinted, can be used for field tinting or adjustment or matching of colors. Select base under "Options". Dry Color Paks, produced either as pure pigments or in the same binder as the product to be tinted, can be used for field tinting or adjustment or matching of colors. Select base under "Options".